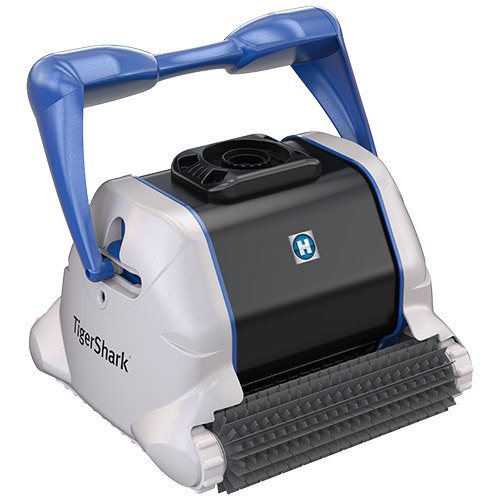 Hayward Tiger Shark quickly and efficiently cleans your pool without your having to lift a finger, removing all dirt, algae, oils and other debris to restore pool surfaces to their former brilliance. Its on-board computer quickly learns the best way to clean your pool, resulting in faster cleaning times and minimal touch up cleaning. Its high efficiency motor assembly provides all the power needed for superior suction, yet uses far less electricity to save you money over the pool season. Its innovative cartridge filter not only filters out more debris than traditional bags, but can be reused after being washed off with a garden hose for further savings. •Easy to setup, maintain and use. •On-board computer quickly calculates the best way to clean your pool. •High efficiency 24V motor provides more power while using less electricity. •Innovative reusable cartridge filter for superior filtering power. •Tank tracks for optimal traction when climbing walls and stairs. •Compatible with vinyl, gunite, tile and fiberglass pool surfaces. •Able to clean pool stairs. giving you back the sparkling clean pool you deserve.